It's definitely getting warmer out, but things are still growing in our garden :) We may only have a few more weeks before the heat becomes too strong for our veggies, especially the lettuces, but I will keep everyone updated when the garden growing comes to an end. Our two different types of tomatoes should be ready to pick soon and we are almost all out of our radishes. Check out these lovely "Easter Radishes" that I picked this Saturday. They are pink on the inside! "Easter Egg radish are petite and round with thin wiry taproots. Colors of their skin range from white to pink to crimson to purple, all in one bunch. Their flesh is bright white and crisp with a mild radish flavor. The Easter Egg radish produces green leaves that grow from the roots above ground, which are also edible. " 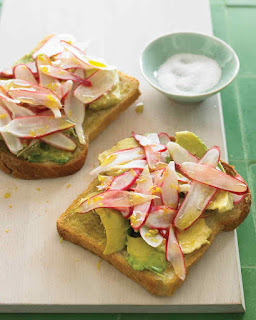 Toss radishes with oil, lemon juice, salt, and pepper. Repeat with avocado, and mash onto bread. Pile on radish mixture, and sprinkle with lemon zest. Drizzle with oil. March 5th was our official Harvest Day event. I'm happy to report that it was a success and also a ton of fun! Thank you so much to those of you who stopped by and helped. You and your children did an amazing job at pulling out the plants that were ready and I delivered all of the delicious vegetables to Chef Tim, in the kitchen, for use during the week. Check out our pictures below and if you get a chance to stop by and say hi on the weekends, I will be there working (we still have new plants that are growing that will be ready for harvesting soon!). It is looking to be a longer growing season than expected which just means more tastey veggies to come!